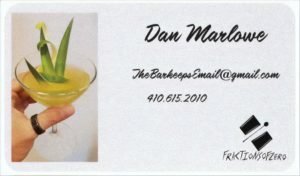 Dan Marlowe is a lifelong hospitality industry member currently doing Consulting and Brand Representation Work. Additionally He is a Brand Ambassador for Bottesi Artisan Bartools and Founder of Bar Basics & Beyond™. Lastly, he is a USBG Member and recent DCCBG Member currently pursuing Bar Smarts Advanced and other paths of continuing education in the liquor industry.